The previous article in this series was a reviews of the many threats a reconnaissance satellite faces. It opened with an interview of the Director of the US National Reconnaissance Office, who stressed how critical it is for her organization to address these threats by creating a resilient, defendable system. She also announced the NRO was spending billions on achieving that goal. So how can they do that? What countermeasures could they deploy against jammers and anti-satellite (ASAT) weapons? Information on the subject is scarce due to its extreme sensitivity. The US Air Force published a Counterspace Operation Doctrine in 2004, which details some of the measures that can be taken to protect space capabilities. An older, 1985 report by the US Office of Technology Assessment goes into more technical details, with a late-cold war flavor. For a less tedious introduction to the context, there is an 60 Minutes documentary featuring the commander of the US Space Command. So this article is based on the public information available about US efforts, with a bit of speculation. It will also draw heavily on an aviation metaphor, as anti-air and anti-satellite operations share some similarities. For instance, in the same way there is a “kill chain” – a series of steps to down an aircraft- in air operations, there is a “kill chain” for space operations. From the point of view of the defense however, a “live chain” has to be set up, to deny a kill to the enemy. The links of this chain are avoiding detection, avoiding tracking, avoiding engagement, breaking the enemy weapon’s guidance, and finally surviving the weapons’ effects. How each of these steps can be applied in space is explored below. In the world of military aviation, stealth has been the American answer to make aircrafts survivable against missile-based air defenses. Following the 1973 Kippur War, US planners realized their planes were too vulnerable to Soviet-made missile batteries, and set out to find a solution. They started a program to demonstrate an aircraft with very small radar, visual and infrared signatures, so that it would only be detected a close range, and too late for the enemy to react. This demonstrator led to the famous F-117 and B-2 stealth bombers, and nowadays even fighters like the F-35 are stealthy. Other nations, such as China and Russia, have also resorted to developing stealth aircrafts. The same thinking can be applied to satellites: since they can be detected through radar, visual or infrared observations, significantly reducing their signature make them very hard to detect. Indeed, the US reportedly launched a stealth satellite to geostationary orbit as early as 1976: the LES-8 satellite was nuclear-powered, so it did not have large solar panels that reflect sunlight and make the satellite glint, and it had a mirror so that sunlight hitting its main body would not be visible from the ground. The USA apparently launched a more evolved version of geostationary stealth satellite in 1990. This satellite, known as Prowler, was only detected in 1998 by civilian observers, likely after it had completed its primary mission and was taken offline. Since optical observations are the most effective way to track objects in geostationary orbits, making satellites that reflect sunlight away from the ground, or that have a very small size, can be enough to hide them. Regarding Low Earth Orbit (LEO) satellites, which constitute the bulk of reconnaissance satellites, radar is a better tool to detect them as it is not affected by weather or sunlight. The USA is also thought of having launched a stealth reconnaissance satellite in 1990, and another one in 1999. Codenamed MISTY, they would have been aimed at avoiding detection by the USSR, to see what the Soviet did not want the US to see and were hiding when they knew a satellite was overhead. A more detailed look into American efforts at making stealthy satellites can be found in the Federation of American Scientist’s stealth satellite sourcebook. Apparently as in the case in aviation, making an already complicated object stealthy has a steep cost, and MISTY was cancelled after two satellites because of that. Small satellites might be a game changer regarding stealth: since they are very small, they do not show up on some space surveillance radars. France’s Graves survey radar for instance does not detect objects smaller than half a meter, and cubesats are smaller than that. Another way to hide a satellite is to have it look like a piece of debris, or a much less capable satellite. That way, even if it is detected, it will not be a priority target, and will likely survive the opening shots of a war in space. Again, this is not purely theoretical: MISTY was deployed alongside a cloud of debris, to make it look like it had exploded and prevent observers from realizing it had simply disappeared. Another apparently successful deception is the KH-11’s early history. Since it was not emitting towards the ground when over the USSR, the Soviet thought it was a weather satellite, and did not realize its true nature until they received the satellite’s user manual from a disgruntled CIA agent. If detection cannot be avoided, then the adversary knows there is a threatening satellite in orbit. The next step is to avoid being tracked, so that the precise position of the satellite is not known, so the enemy does not have a firing solution on it. One solution to evade tracking is to maneuver: the orbit of a satellite is predictable once its speed and position are precisely known, because the only force acting on it is gravity. Ground sensors typically see satellites once or twice a day, for a few minutes, and rely on the laws of orbital mechanics to know where they are the rest of the time. However, if the satellite uses its engines to change its orbit, then the information obtained before becomes partly obsolete. The more the satellite changes its orbit, the further away it will be from its predicted position and thus the less likely it will be reacquired quickly. However, changing the orbit is usually done by consuming chemical fuel, and satellites carry a limited supply, so they cannot maneuver all the time. Satellites with less fuel-hungry electric engines exist too, but these engines have much less power and thus take a long time to change significantly the orbit of a satellite. Furthermore, making a satellite somewhat stealthy will make it harder to reacquire, thus bringing additional benefits to maneuvering. Another way to avoid tracking is to detect then jam the tracking sensor. For radar, that means carrying a radar tracking detection payload, also known as a radar warning receiver. Early US film reconnaissance satellites carried such a system, as a part of a “vulnerability payload“, to know if the Soviet were tracking or interfering with them. Modern US satellites probably carry the same type of systems. Detection can be also carried out using dedicated signal intelligence satellites that keep watch of radar emissions, although mounting sensors on the target spacecraft ensures a more reliable detection of a tracking attempt. Laser tracking can also be detected in a similar way, whereas optical tracking is completely passive and thus cannot be detected directly. The next step is then to emit radio waves towards the tracking radar, to interfere with its signal and break the detection, much in the same way a fighter way uses its electronic countermeasures against a ground radar. The aviation systems probably have quite a bit of similarity with potential space electronic warfare systems, as they are optimized to be low volume, lightweight and use limited power. There are however two big differences: the distances involved in an ASAT engagement can be much longer than in air combat, and in-space systems cannot be updated or maintained. The first gives an advantage to the satellite, as a radar tracking a satellite at a representative distance of 1000km will receive a signal 10 000 times fainter than if it was tracking an aircraft at 100km. That makes the satellite’s jammer a hundred times more effective than if it were carried on an aircraft. The second means that the satellite will use the same hardware for all of its life, which can be up to 15 years. This is a disadvantage, as ground systems can be upgraded much faster, and the satellite’s countermeasures might become obsolete and quickly lose at the game of cat and mouse that is electronic warfare. If the enemy has a solid track, then the satellite better be able to keep itself out of the range of its ASAT weapons. This can be accomplished by changing the orbit, at the cost of some precious fuel, to avoid a threat in the short term. However, due to orbital mechanics, a typical polar LEO reconnaissance satellite will eventually expose itself and pass over the threat (the orbit is designed for covering the whole globe in the first place). Another way to avoid engagement is to deter the adversary from actually carrying it out, by making clear the political and diplomatic costs of such an action. The threat of a symmetric ASAT attack in retaliation, or of an asymmetric conventional or cyber counterattack, could be enough. Finally, a possible strategy could be to position vulnerable satellites close to third-party satellites: for instance, the US USA-276 satellite was launched in an orbit coming very close to the International Space Station, within a few kilometers. This might be to observe the ISS, or to use the ISS as cover: any kinetic ASAT hitting USA-276 would create a cloud of debris in the station’s path, likely rendering the ISS unusable, if not destroying it eventually. Thus, if Russia were to target USA-276, it would destroy the crown jewel of its own manned spaceflight program, and if China were to do it, if would involve an angry third party in the conflict. That’s useful political cover. Such a scenario could also play out in geostationary orbit: creating debris crossing the GEO belt threatens all the satellites there, and would incur a global outrage. A vulnerable satellite could also be placed among a cluster of communication satellites like the one in the video below, so that an ASAT sees several targets and has a chance to hit a civilian satellite instead. If the previous countermeasures have failed, and the enemy has a precise track of a satellite, with the satellite having come into the effective range of the ASAT system and being shot at, then a last-minute saving move it to break the guidance of the ASAT weapon. Conventional ASAT have to come very close to the target in order to destroy it by direct impact or blast, and consequently require terminal guidance in the final moments of their trajectory, in order not to miss. This means they have to use a sensor onboard the weapon, and that sensor can be fooled. Nuclear ASAT however might not need such precision, and do not necessarily require terminal guidance. As seen in Contested Space I: Threats , the terminal guidance of ASAT systems can be either infrared or radar, so countermeasures against both are required. However, a first step before activating countermeasures it to realize that they are needed, by detecting the engagement has taken place. This means the defending side must have a good situational awareness, to detect either that a direct-ascent ASAT has been launched from the ground, or that a co-orbital ASAT has maneuvered to get on a collision course. Regarding the direct-ascent launch, it can be detected in much the same way a ballistic missile or a surface-to-air missile launch can be. Since this kind of system requires firing a respectably-sized rocket to get the warhead to the satellite’s altitude, it releases a large quantity of thermal energy. This can be detected by an infrared sensor that can be carried by the satellite. Like for radar warning receivers, such systems exist for combat planes. They might be somewhat simpler to implement for satellites, are ASATs are most likely to be fired from ahead the satellite (to not have to catch up with it), and use larger engines than anti-aircraft missiles. Another way to get notice of a rocket launch is to use sensors on other satellites. This is exactly what dedicated missile-warning satellites, like DSP or SBIRS in the US, do. They keep a constant watch on Earth using infrared sensors, detect any launches and give a rough estimate of their target. Other ways to detect approaching objects exist in the aviation world, such as small radars that pick up signals approaching the carrier at high speed. They probably have shorter ranges than their infrared counterpart however. On the other hand, co-orbital ASAT need a big rocket to be put on orbit, but can stay dormant in orbit for a while. When they finally engage their target, they only need a small burn to put themselves on a collision course. That is much harder to detect than a direct-ascent launch, so the best bet to detect an engagement is to always track the orbit of the ASAT, through radar (in LEO) or optical (in GEO) means. If a threatening maneuver is detected, that means an engagement has likely started. Keeping a permanent watch over objects in GEO is the mission of the US Geosynchronous Space Situational Awareness Program, which consists in a constellation of medium satellites near geostationary orbit. France intends to put surveillance cameras on its military satellites to detect objects coming close. Once the engagement has been detected, the satellite can use electronic systems to jam the terminal guidance of the ASAT weapon. If it is radar-guided, electronic countermeasures similar to those used to jam search and tracking radars might do. If the guidance is infrared however, a different solution needs to be used. Since anti-air missiles often have infrared guidance, directed energy countermeasures have been developed against them. They use an infrared laser precisely aimed at the missile to saturate it or confuse its tracking algorithm. The video below explains how one such system works. Similar systems might be carried by large satellites that have the spare mass and volume to install them. The final step in breaking ASAT terminal guidance is to use decoys. It is especially interesting in the case of direct-ascent ASAT: they close the distance with the target so fast that they only have a very limited amount of time to discriminate the real target from the decoys, and if they miss once, they cannot come back for a second attack. Continuing with the aviation examples, decoys exist against both infrared and radar seekers. Infrared decoys are called flares, and consist in a myriad of small burning objects which mimic the temperature of the aircraft and its engine. Radar decoys are called chaff, and are small piece of reflective material which are released as a cloud, and make a false target for the missile. A distinct feature of the use of decoys in space, which makes it different from the other warfighting domains, is that there is no friction in space. In the air or on the seas, decoys quickly lose speed and become stationary due to the resistance of water or of the air. So decoys have a different motion than a plane or a ship, and that can be used to discriminate them. In space, decoys continue on their way. If they are given a small speed at release, they will keep that speed and follow a plausible orbital trajectory. So they cannot be distinguished from a non-maneuvering satellite based on their motion alone. The lack of friction in space also means that the shape of the decoys is not constrained by the need to float or be resistant to wind. Consequently, lightweight, fragile decoys can be used very effectively in space. This is a feature of space combat that has been used to make sure intercontinental ballistic missiles reach their target in spite of anti-ballistic missile (ABM) defenses. A mid-course ABM engagement is very similar to a direct-ascent ASAT engagement: the ABM system needs to detect, track and then destroy a nuclear warhead flying above the atmosphere at near orbital velocity. This is challenging but technically feasible, so missile designers had to make the warheads more survivable. They found that using inflatable decoys shaped like the actual warheads was very effective: they have the same trajectory as a warhead, the same radar signature if correctly designed, and a similar infrared signature if a small heater is embedded in them. So they look almost like the objects they protect: this is called a replica decoy. Another type of ICBM decoy that is even more effective against sensor systems with very high discrimination capabilities (ie that can very precisely measure the radar or infrared signature of an object) is the anti-simulation decoy. Contrary to the replica decoy that looks like the real object, an anti-simulation decoy can look like anything. The trick is that the real object is modified to look just like the decoys. In the ABM world, this means that anti-simulation decoys can be inflatable balloons, and that the warheads are encapsulated in similar inflatable balloons. It is interesting because a replica decoy will never match exactly the characteristics of the real object if it is to be lightweight: some compromises have to be made on its shape, materials, radar and thermal properties. An anti-simulation decoy does not have to be accurate in shape or material: it just has to mask the signature of the real object so that seen from the outside, it has the same surface properties as a decoy. The reader should understand that there is no static answer to the question of whether a missile defense can work against countermeasures. It depends on the resources expended by the offense and the defense and the knowledge each has of the other’s systems. Russian patent showing a satellite launching a container of nanoparticles in the direction of an ASAT threat. The container then deploys a cloud of particles. So leaving the ABM issues aside, what do anti-simulation decoys bring to an ASAT engagement? The answer is that satellites are much more complex objects than reentry vehicles, and consequently have much more complex radar and infrared signatures. That means replica decoys must reproduce these complex signatures to be effective, in turn making the decoys complex, massive and costly. Anti-simulation decoys however can be kept simple. Since they only have to mask the radar and thermal signature of the satellite, simple inflatable or quickly deployable structures might be enough. For instance, a deployable sheet of reflective metal large enough to hide the satellite behind it might not be very massive: solar sails weigh down to 140g/m2, so a screen of 6mx6m weigh only 5kg. Some mass needs to be added for the deployment mechanism and maybe for a heater to change the temperature, but it is still very light. And being reflective to radar and infrared, it can make a good anti-simulation decoy. 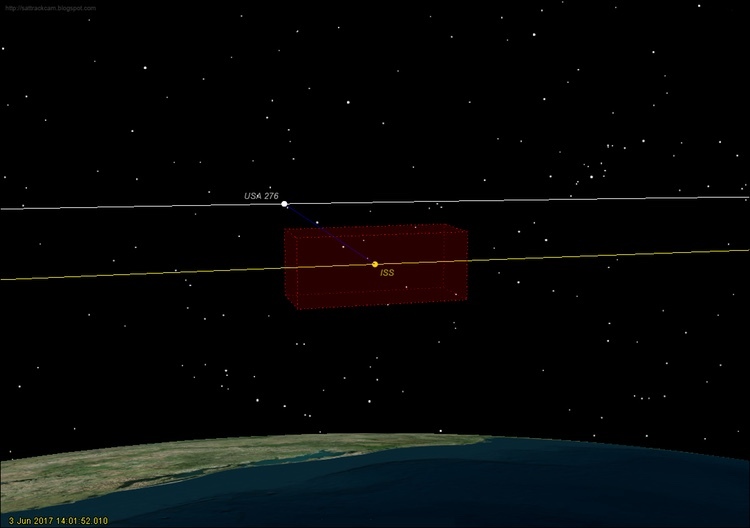 In an engagement, the spacecraft would deploy a multitude of such screens, facing in the direction the ASAT is coming from (which can be detected using onboard infrared sensors). The screens would each be imparted with a small velocity to separate them from the satellite, and the satellite would deploy its own screen in front of itself. The screen might cut sunlight from its solar panels and obstruct its sensors, but it is only temporary. When the ASAT gets close to it, it is faced with an array of objects that all look the same, and are all on plausible trajectories. Consequently, it can only pick one at random, and if there are enough decoys, the probability it picks correctly is extremely low. Against a co-orbital ASAT however, decoys might not work as well. First of all, the ASAT could follow its target at a very close distance, and there is no treaty or international norm preventing that, only a high diplomatic cost. From that distance, the attack can be almost instantaneous, and the ASAT might see its target so well that any use of decoys will be too little and too late. The only way to save the target satellite is then to shoot first and take out the orbiting ASAT. Against an ASAT orbiting at a larger distance, decoys can still be deployed and temporarily confuse the enemy sensor. Nevertheless, a maneuvering ASAT can match the orbit of any decoy and stop close by to investigate it, and know if it is the real target. The strategy can then be to deploy enough decoys, with each decoy having a sufficiently different orbit that the ASAT does not have the necessary fuel to match orbit with each and every of them. Apart from the technical solutions above, other ways exist to break weapon guidance. In non-space domains, cover can be used to hide from the weapon. However cover is scarce in space. The closest there is to it is other satellites, and suddenly maneuvering to get close enough to them is not possible in a typical direct ascent scenario in LEO. In GEO, the weapon takes a few hours to reach the target’s altitude, so some aggressive maneuvering to get quickly close to a nearby commercial satellite might do, although it remains unlikely if the satellite is not already nearby. Outrunning the weapon is also an unlikely solution, as an ASAT can be very lightweight and carry a large amount of fuel relative to its mass, whereas an actual satellite is much more massive and thus requires a lot more fuel to move. Finally, the satellite could carry kill vehicles of its own, and launch them to try to intercept the ASAT. Since they only need to get in the path of the weapon, they need very little maneuvering capability, so that might be a workable solution against co-orbital ASATs. The resulting debris after a collision is an issue though. If the ASAT weapon has been launched and despite all efforts has impacted or detonated close to the satellite, the next step to ensure the survival of the latter is to harden it against the weapon’s effect. When defending against jammers, that means hardening the satellite’s sensor, by adding a fast shutter to protect the optics for instance, or by making the antenna insensitive in the direction of the jammer for radar satellites. Of course, hardening the sensor makes it costlier, so a balance has to be found. Against direct-impact weapons, there is not much that can be done: either the ASAT has impacted a decoy close by and with luck the debris will not hit the satellite, or it has impacted its true target and then no satellite can survive the kind of energy released by a collision at several kilometers per second. Against nuclear explosions happening not too close, for instance if a nuclear ASAT has hit a decoy, some form of hardening is possible to prevent the X-rays released by the explosion from frying the satellite’s electronics. However the decoys might not get far enough in time for hardening to matter. A more comprehensive solution is to look at the satellite as a part of system, not as an isolated asset. What matters is that the capability provided by the system endures an ASAT attack, even if parts of it are destroyed. This can be accomplished by launching a large constellation with many satellites, which is relatively easy for Smallsat constellations, or by having replacement satellites ready to launch on short notice. Establishing near-real time Space Situational Awareness (SSA), in LEO and GEO, to detect direct-ascent ASAT launches and maneuvers by co-orbital ASAT. Ground SSA assets, complemented by the SBIRS and GSSAP satellite constellation, probably already allow an extensive SSA capability. Radar warning receivers carried by the LEO satellites could also contribute to the situational awareness, and per the NRO’s history are probably already installed. Setting up an integrated and responsive Command and Control architecture, to quickly decide on the course of action after a threat has been detected, and to execute the decisions swiftly. This requires almost constant contact with the satellites, which the US probably has thanks to its heavy use of relay satellites. It also requires a clear chain of command uniting both DoD and NRO personnel under a single roof. This has already been achieved through the creation of the National Space Defense Center. Equipping future satellites with enhanced maneuvering capabilities and countermeasures to break terminal guidance, to avoid being hit if fired upon. Anti-simulation decoys seem to be a relatively simple and lightweight option, yet like in the ABM field they probably pose a serious challenge to most threats. Demonstrating the ability to retaliate in kind with ASAT weapons, which the shoot-down of USA-193 by a SM-3 missile did. While most likely only the USA has implemented all these steps, other space powers might make their systems more resilient at a more limited cost by adopting only some of them.